Last Thursday and Friday, the Recovery Café Network (RCN) hosted Recovery Cafés from across the United States for its inaugural Rendezvous conference. Recovery Cafés from Washington, D.C.; Raleigh, North Carolina; San Jose, California; and Everett, Spokane, Tacoma, Vancouver, Orting, and Seattle in Washington State came together for two days of learning, information sharing, and inspiration. In her opening address, Killian spoke about the need for our hearts to be continually re-broken in order to be present to the women and men coming through each of our doors, meeting each person where they are at and walking alongside them in their recovery. Held at Plymouth Church in downtown Seattle, information sessions focused on: the importance of each Recovery Café honoring multiple pathways to recovery, lifting up leaders in each community, fundraising, and implementing structures of loving accountability. One panel each day offered wisdom from currently-operating Recovery Cafés to everyone in the room. 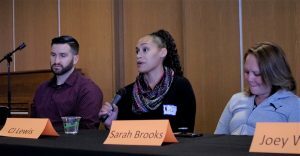 On Thursday, a panel made up of Dana Bainbridge, San Jose’s founder; Jason Fitzgerald, Seattle’s Operations Director; and Georgia Butler, Spokane’s Program Director, highlighted the importance of welcoming individuals where they are, as they are, and help them tailor their own unique pathway to recovery. On Friday, Joseph Conniff with Seattle’s Drug Court; TerriD Rhodes, a Seattle floor manager; Sarah Brooks, Everett’s manager; CJ Lewis, Tacoma’s administrator; and Joey Wild, Kleen Street’s Co-Founder, discussed raising up Member leaders and their own journey to leadership in the recovery community.